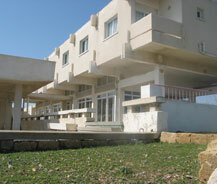 Karpaz View Hotel, as the name itself contains the city name, the hotel is also situated at the same towards it's far eastern side. This place, Karpaz, is famously known in the local as panhandle. Karpaz is rich in natural beauties surrounded with mountains and the sea. The hotel also incorporates a private beach, which has all the facilities with bars and seafront restaurants. Those bars supply variety of drinks to guests and the restaurant at the seafront provides delicious dishes such as fish, prawns, and other sea foods. The hotel's restaurant provides various countries dishes with great quality and taste as they have separate chefs for each dish. Karpaz View Hotel has 13 double bedrooms with facilities such as satellite TV, mini bar, hair dryer, direct telephone line, safe case, bathrooms with shower and balcony. The balcony allows guests to have a great view of sea and mountain around the place. Near this hotel there is an ancient historical site of Apostolos Andreas Monastery. This is an ancient historical site and many visitors are attracted by this monastery and those people enjoy accommodation in this Karpaz View Hotel with safety and privacy. People interested in enjoying a holiday trip are always welcome and you are greeted with great pleasure.